Hello and welcome to the milly and pip blog. This is my first attempt at joining the blogging world, so please be patient with me while I find my feet (and my voice). It's taken me ages to pluck up the courage to start a blog as I'm convinced I won't have anything remotely interesting to say. I have read so many wonderful blogs, ones which have inspired me, made me laugh (and made me cry) and if I can be half as interesting as them, I will be very happy indeed. I hope to keep you up to date with news from the studio and to share the things that I love. 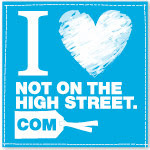 Oh, and if anyone knows how to get a nice notonthehighstreet.com button please do stop by and let me know. Yehh! 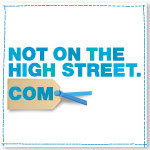 Welcome to the world of blogging - will happily follow! I am a relative new blogger as well, and still trying to find my 'voice!' I am enjoying writing though, and I discovered a short film that inspired me to keep going, it's under a post called Lost on my blog if you wanted to have a look. Good luck with your journey, and I will look forward to reading about all your ventures!